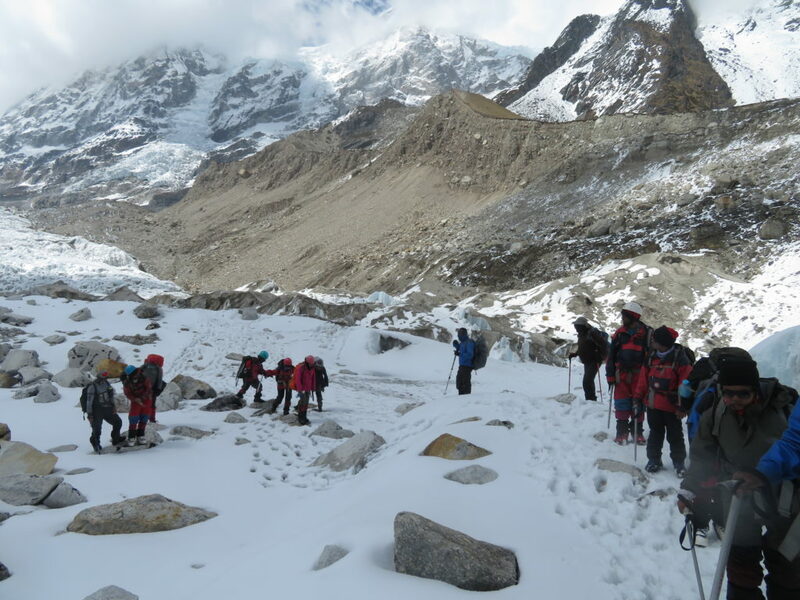 The first day at Base Camp was tough to say the least. 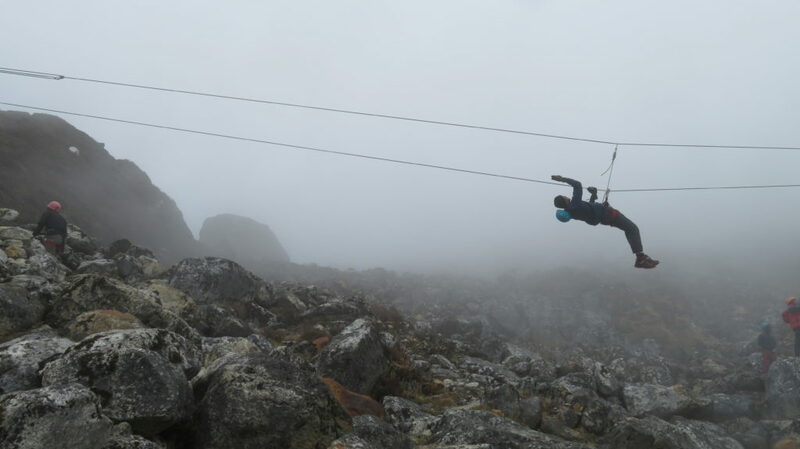 Some friends started experiencing symptoms of high altitude sickness, which include a heavy head, nausea. To reach the toilet, there was an uphill walk, crossing some rocks, then some downhill climbing! And the cold! It took a while getting used to. Dessert helped me cope. This was an addition to the dinner menu at Base Camp. We were treated with custard, sevian, suji ka seera; followed by a hot drink which was Bournvita or Horlicks. The presence of a Doctor on campus and Sulakshana Mam’s encouragement helped sail through. The first day we were taken for a walk to the surrounding area and introduced to the peaks around us. I learnt that Kanchenjunga is declared as a holy peak by Sikkim and therefore no one is allowed to climb from the Indian side. The last expedition to the peak from India was in 1999. 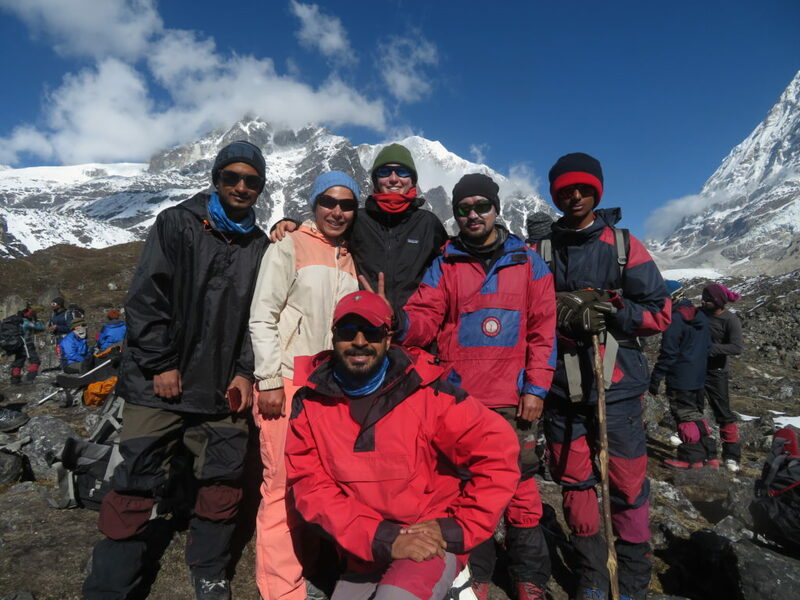 Mt.Pandim at 6690 metres is a virgin peak. One of the most beautiful looking mountains we could see is Mt.Frey at 5,830 metres; which involves a very technical climb. The Rathong pass was not very far from our Base camp. Nepal lies beyond the pass. Mt.Rathong (horn of a goat), 6,679 metres has its approach from Nepal. The next day, the weather was cloudy, therefore we did not go to the Glacier. Instead we were taken to learn how to arrest a fall, which is part of Snow Craft. You cannot predict how you will fall in the mountains, slip down as if on a slide or head first or stomach down. I was terrified of the mock drill. Before I could think of how I would practice falling on the slope, a friend rushed towards me, lifted my leg and I lost balance! I also lost my fear of falling as I arrested my fall along the slope. We had a drill in walking roped up as a group. That is how you walk in the mountains, in groups of 3 to 5. If one of the team members falls or they come across a hidden crevice, the others can pull him up. We learnt how to distribute a rope in different scenarios, when there are 3, 4 or 5 members. 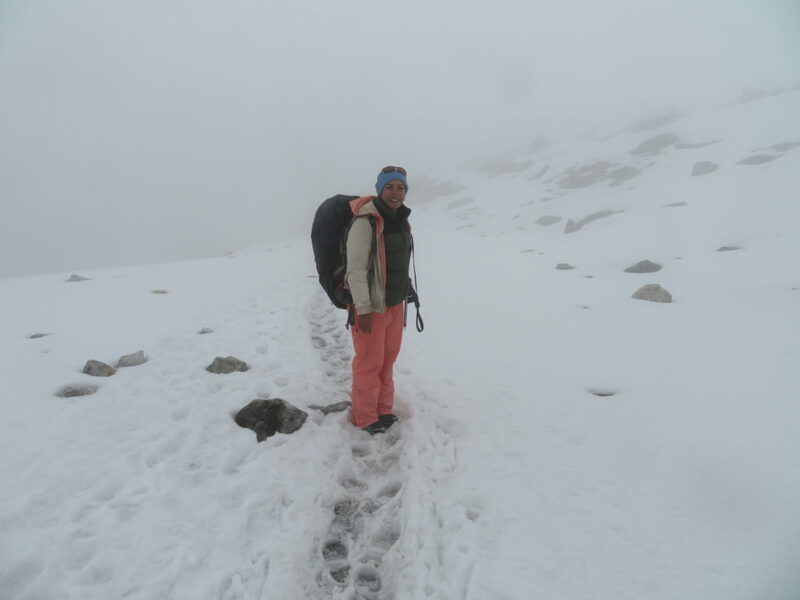 The rope is indeed the lifeline of a mountaineer, like I shared in part 1. Day 3 we were introduced to snow shoes, crampons and the ice axe. My group instructor asked me to walk around the base camp in those shoes. Getting over my fear of downhill climbing was one thing. Walking downhill wearing a 1kg shoe was quite another! I prayed at night that there be no snow and I would not have to wear these shoes. 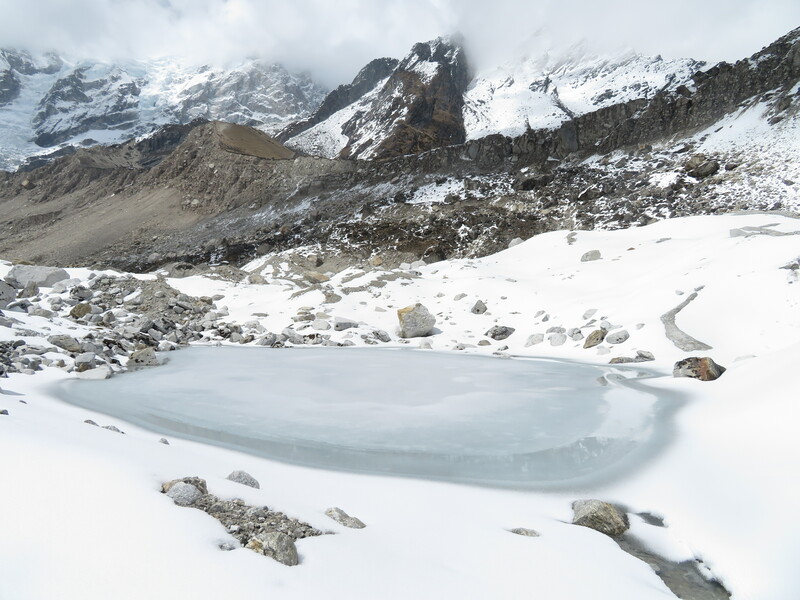 But we were in an area above the snow line and we were training in a glacier, which is made of ice and snow! The reason for my first breakdown in the course were these shoes. Day 4 brought clear weather and we started the walk to the glacier. The approach was an uphill walk on a rocky mountain. It had snowed the night before, where snow had covered part of the rocks. Assessing your step was that much more challenging as I did not know how deep the snow was or where the rock ended. I kept tripping. Friends and teachers helped me reach the top. 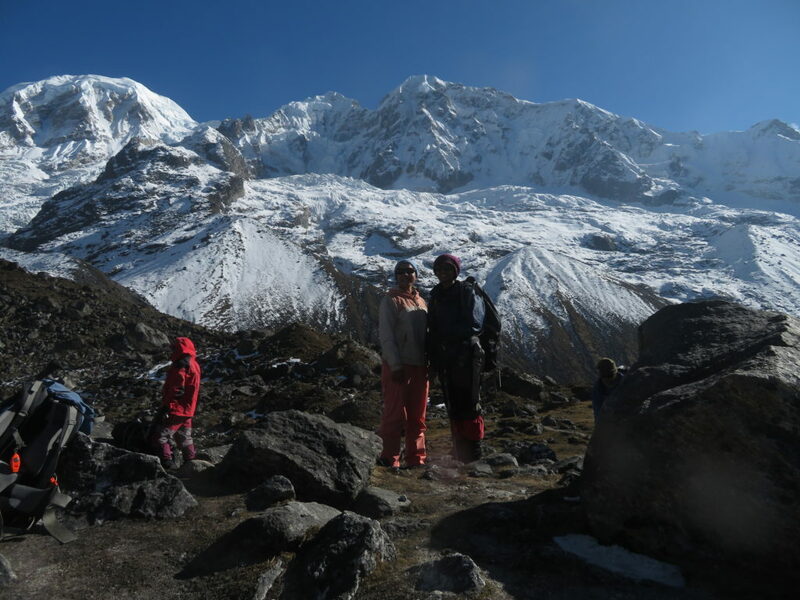 Days at the base camp comprised of a walk to the glacier or an activity in the mornings, typically from 7a.m. to 3p.m. 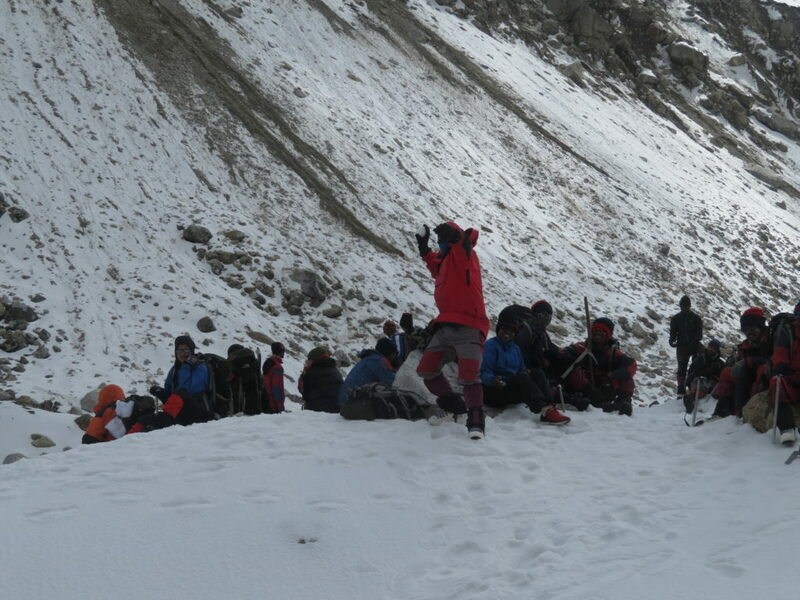 Afternoons were lectures on Glacier, how to plan an expedition, natural and artificial anchors and more. Evenings were spent in playing Mafia with friends! We learnt that mountain climbing is one of the causes for glaciers to melt. There has always been this dilemma in the mind, with the damage that has been done to Mother Nature. And it continues to trouble me. There are pangs to be in the mountains. Seeing the introduction of concrete amidst delicate eco-systems is sad to see. I still search for answers on this one. 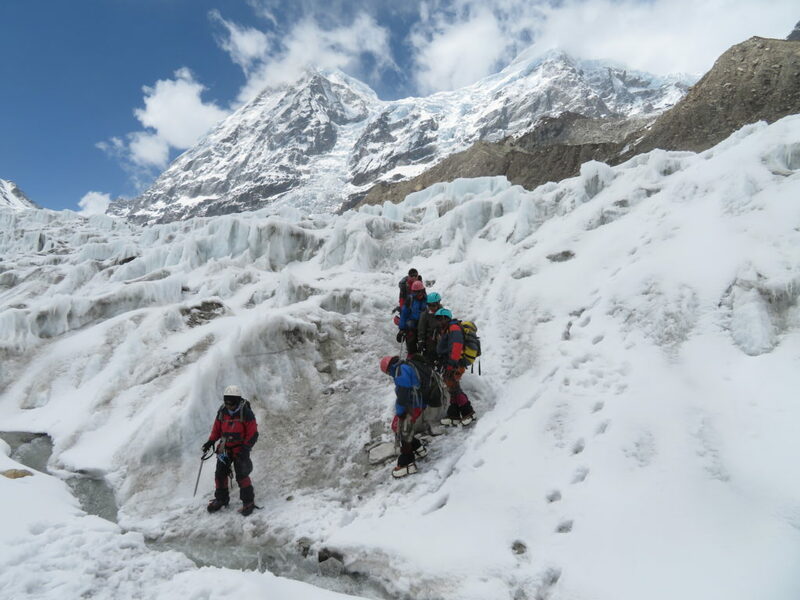 We were trained at the glacier for 4 days. 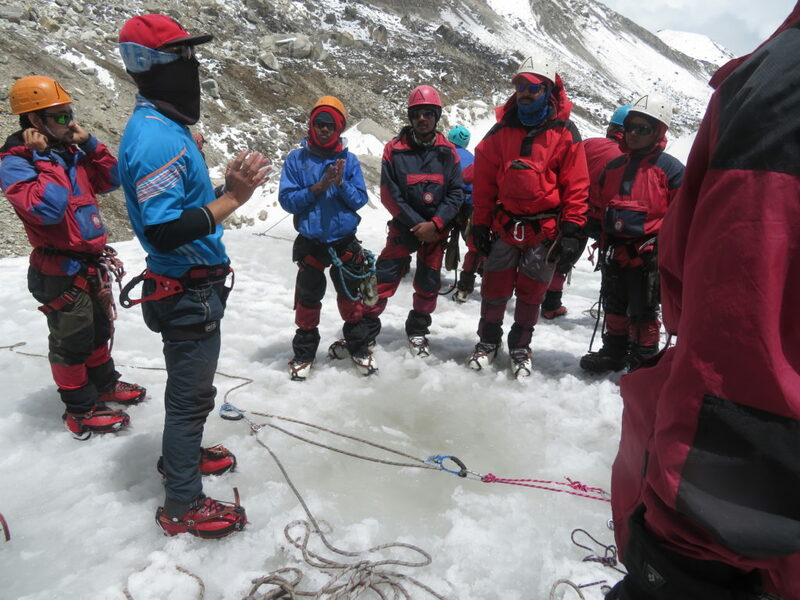 We learnt how to climb an ice wall without the ice axe, with one ice axe, with two axes and then with a Jumar. It is interesting how the Jumar got it’s name; the founders Adolf Jussi and Martin Rossi took 1 syllable each from their name and put it together. Climbing an ice wall requires technique, I kept hearing our instructors tell us to climb on toe point. After climbing half the wall, the calves are screaming! It is a heavier workout than doing calf raise a 100 times! One thing is for sure, one comes back fitter at the end of the course. You discover that your endurance is much more than you thought it to be. And you also realise how much more strength and stamina you need to build. One activity that taught me this more than anything else was Bouldering and Jumaring. 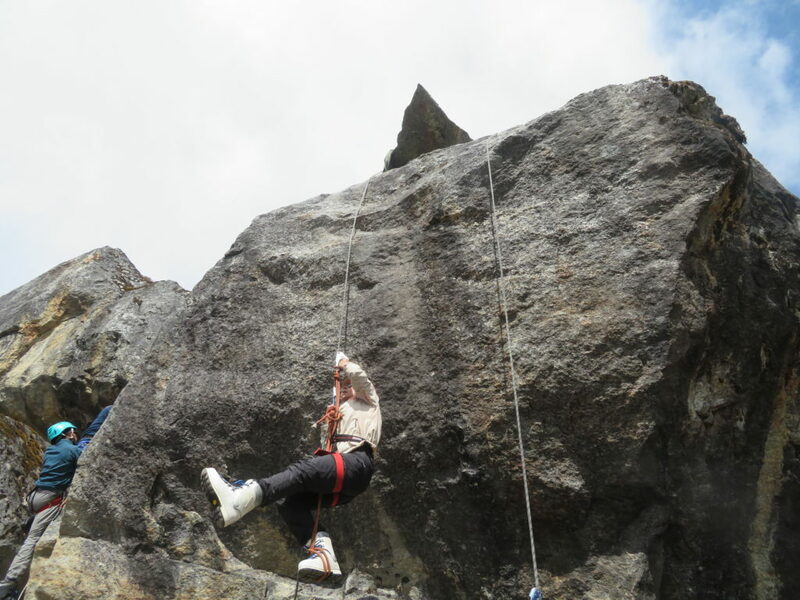 Bouldering and Rock Climbing involve climbing a rock with the support of your fingers and toes, not hands and legs! Look for toe holds or grooves in the rock where you can place your feet and pull yourself up. It requires a beautiful harmony of upper body strength, agility, balance and being light on your feet. On the 2nd last day, we scaled Mt.Renok, a peak at 16,500 feet. 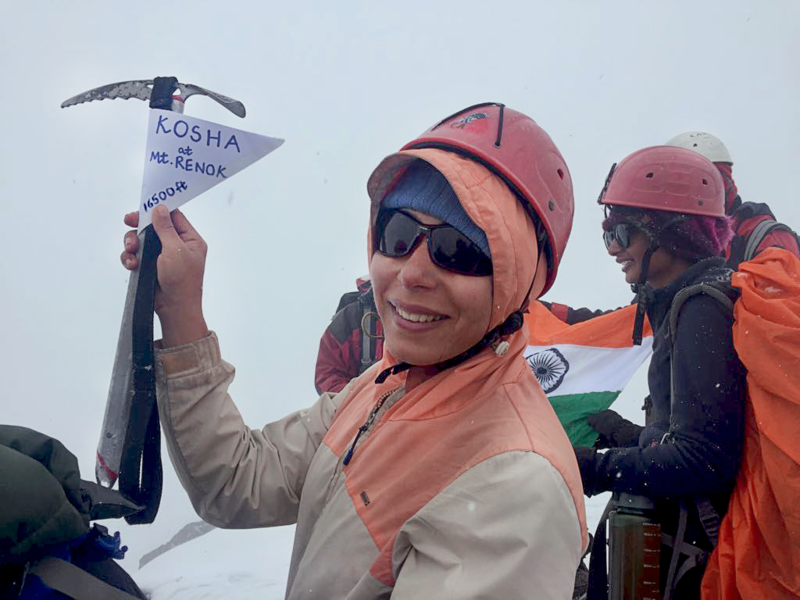 While it felt great to be on top of a mountain, after the intense training and trek to reach base camp, the walk to the summit felt relatively easy. 60 of 62 batch mates could reach to the peak. 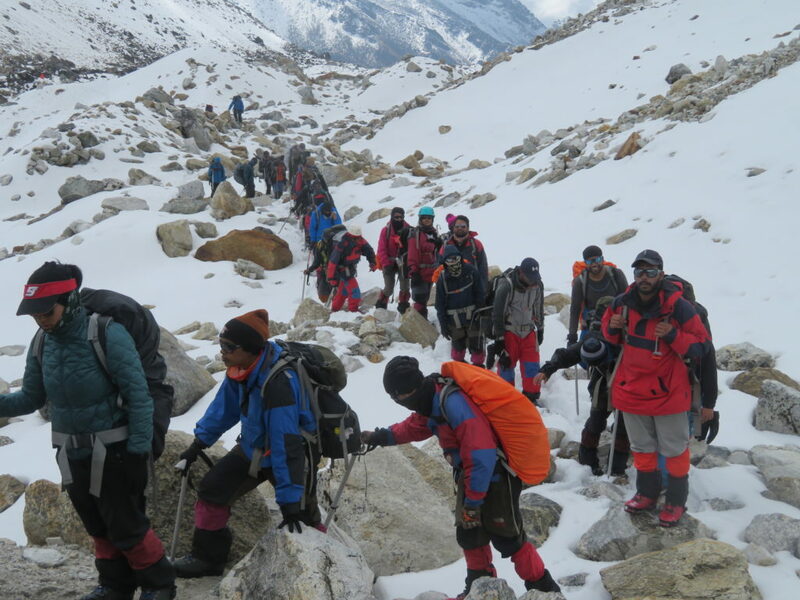 As we prepared to pack our bags and clear the campsite, it was time to welcome the Advanced Mountaineering Course students back from Advanced Base Camp. They started reaching base camp at 7p.m. and it was a sight to behold. All we could see was blobs of light coming down the mountain, a trail in yellow. It was the students wearing their headlamps. The countdown to reach HMI campus was decreasing. We were closer to the hot water shower. I lived in Kosha thermals and the breathable jacket for the last 10 days with a wet wipes wash every 3 days. The anti-odour properties in the garment really help. It was time to return the show shoes and ice axe. I was happy that I would not have to spend 15 extra minutes in the morning to wear these shoes. One last night in the Tin hut with all the girls bundled up close to each other. One last night of going to the loo under a sky full of stars. The morning was going to take us to fresh socks, which did not smell. And along with us, we were taking back lots and lots of happy, unforgettable, unbelievable memories. The question remained, do I want to be a mountaineer. Read Part 4 as my journey takes me through the last phase of the course.